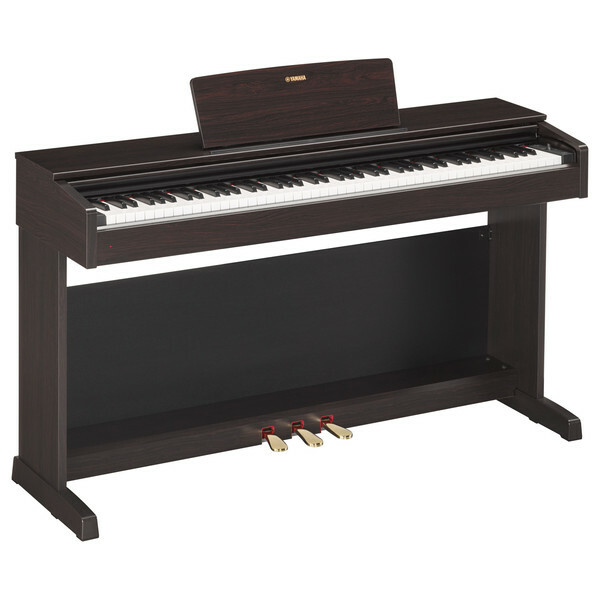 The Yamaha Arius YDP 143 in rosewood is a good choice for beginners and developing pianists. With an improved sound engine and increased polyphony, the YDP 143 opens up more possibilities for expression. The Stereophonic Optimiser guarantees you the very best sound, even when playing with headphones, while the newly improved reverb brings depth to your playing. This piano is also now compatible with a host of apps including the Digital Piano Controller for easy and intuitive control. The custom sound engine from Yamaha is the result of years of piano-making expertise and state-of-the-art technology, producing exceptionally accurate and natural piano tones. The Pure CF Sound Engine utilises the latest digital piano technology to deliver unparalleled quality and accuracy, reproducing the sound of the renowned Yamaha CFIIIS 9' concert grand piano. The technology and the original sound of the CFIIIS grand piano results in an articulated and natural response, capturing the sound of the CFIIIS piano perfectly; so you hear every nuance of the sound with exceptional clarity. As well as the Pure CF Sound Engine, the Arius YDP-163 features fully-weighted keys, reproducing the touch of an acoustic piano for natural playability. 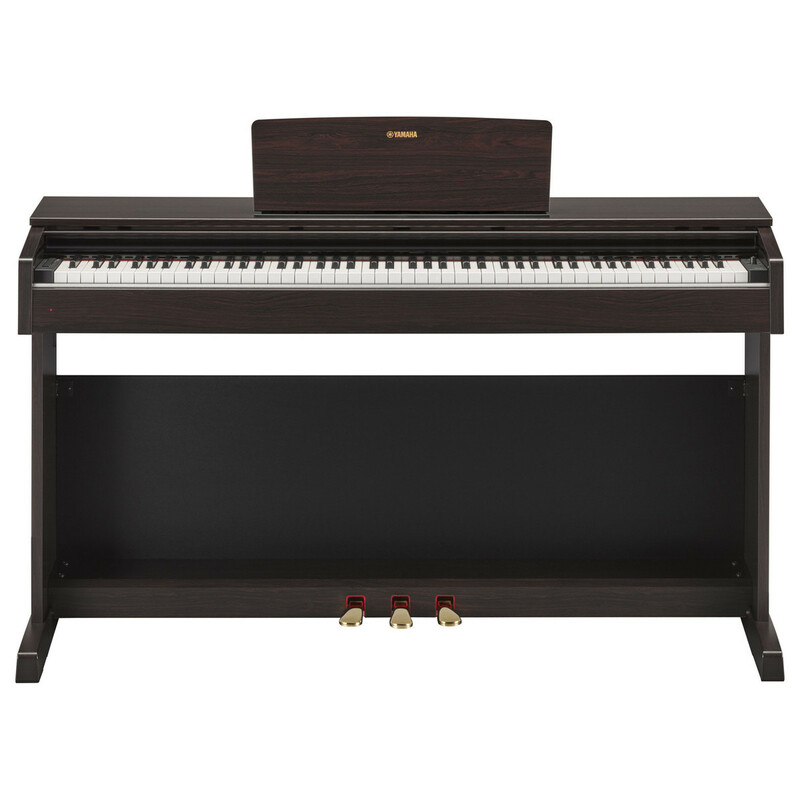 The Graded Hammer 4 (GH3) 88-key piano action recreates the natural feel when touching the keys, reacting accordingly to velocity changes and providing that 'heavy feel' in the lower register. The piano action also features a three-sensor configuration which analyses and interprets the behaviour of the keyboard, providing a natural response and feel. This lets you hear ever nuance of the sound, providing authentic expressive control with the synthetic ivory key tops only adding to its natural feel. As well as the natural sound and authentic feel, the YDP 143 features a range of features that adds to its versatility and functionality. One of the most unique features of this digital piano is the ability the record your performances with a single touch of a button. This recording function allows you to record up to 2 tracks for simultaneous playback, allowing you to record both hand separately or allowing you to overlay different voices and parts. Recordings are created in the Standard MIDI file (SMF) format, which can be played back on a computer using compatible software (not included). Expanding on its integrated recording functionality, the YDP 143 also features a range of digital connections for connecting your digital piano to devices such as your computer or an iOS device. The Digital Piano Controller app is available for all iOS touch screen devices and it adds a new level of functionality to your instrument. The app lets you access features, adjust settings, select voices and record performances all from your chosen device at the touch of a button. The YDP 143 can also be connected to your computer or mobile device via a standard USB cable. This enables the instrument to be used in conjunction with other software such as Digital Audio Workstations, allowing you to use the digital piano as a controller for software and VST instruments. A great feature of digital pianos is the ability to practice in silence using headphones. The YDP 143 has catered to this feature with the Stereophonic Optimiser. The Stereophonic Optimiser works by adjusting the spacing of the sound and the separation from the instrument, resulting in a natural and spacious, surround sound quality, immersing you within the pianos natural tones. This helps to perceive the sound of the piano as coming from the body of the instrument rather than the headphones, providing a more realistic and natural playing experience.